Two years ago, Stephanie's cat, Fabio, was stolen. After months of searching and posting pictures of him, Stephanie had to move. It broke her heart to think Fabio might find his way home and not find her there. Several months ago, Denise noticed a new visitor in the colony of free-roaming cats she feeds and cares for in Evergreen. She brought him to the Task Force to be neutered and vaccinated. 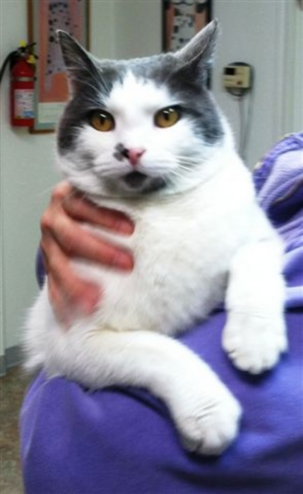 When it was discovered that the cat was already neutered and was very friendly, he was scanned for a MICROCHIP. FABIO HAS ONE! Within hours, Fabio's owner was located and the two were reunited yesterday. KUDOS to Stephanie for having Fabio microchipped, and to Denise for her vigilance and the care she provides for animals of all kinds! You both are heroes to us and, of course, to Fabio!